Lombard, Ill.—Stevens & Tate Marketing has landed three new real estate advertising accounts: Plote Homes, Bob Ward Companies and Foxford Communities. “These three clients are a solid addition to our real estate marketing portfolio,” said Dan Gartlan, Stevens & Tate president. For more than 20 years, the agency has provided real estate companies across the country with bold, innovative creative and media strategies that generate trackable, measurable results. For Plote Homes, based in East Dundee, Illinois, Stevens & Tate was tasked with promoting two upscale lifestyle communities. To maximize impact and minimize waste, the agency focused on geotargeting—both digitally and through local print publications—for the builder’s real estate advertising. Messaging for each community needed to differ to appeal to each audience; however, maintaining a consistent brand was important. The Plote name was recognized throughout Chicagoland for heavy construction and project management as well as residential homebuilding. 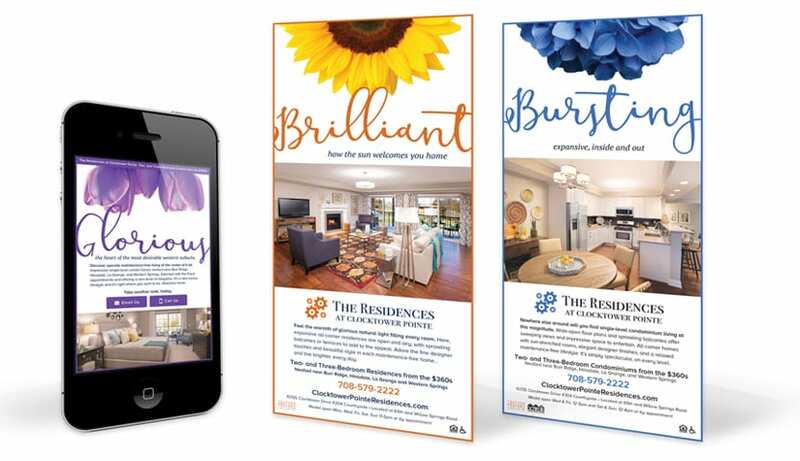 Stevens & Tate created a flexible campaign that capitalized on the Plote Homes brand of luxury homes and lifestyle properties while emphasizing each development’s unique selling proposition. The real estate marketing campaign launched online and in print in northern Illinois and southeastern Wisconsin for the spring selling season. In conjunction with Innovative Builders Solutions of Maryland, Stevens & Tate created a strategic media plan for Bob Ward Companies. Bob Ward Companies is one of the largest homebuilders in metropolitan Baltimore with both townhome and single-family-home communities in Maryland and Pennsylvania. Since 1983, the company has built nearly 3,000 homes and has developed commercial properties, as well. To meet its 2016 sales goals, Bob Ward Companies needed to be proactive—rather than reactive—in its real estate marketing strategy to attract more prospects. Stevens & Tate created a comprehensive media plan designed to increase traffic to the builder’s on-site sales centers. The media mix included a strong online presence anchored by a digital programmatic network to narrowly target active home shoppers. Email outreach programs also focused on consumers in the market to purchase homes as well as Realtors. Social media was added to the real estate advertising mix, too. For Foxford Communities, located in Chicago’s western suburb of Hinsdale, Stevens & Tate was brought on board to energize an existing condominium property. The agency developed a digital real estate marketing strategy to generate on-site and online traffic. The media mix combined search engine marketing, ad network display advertisements and outreach emails to connect with potential buyers across multiple channels. During the planning stage, Stevens & Tate conducted a survey of prospects who had previously visited the community to learn their opinions and buying intentions. Findings from the survey were used to guide the messaging for all outbound marketing, with advertisements highlighting specific attributes condominium buyers said were most influential. The agency also discovered that the majority of those polled were still shopping for new homes. To keep these potential homebuyers engaged with the community, Stevens & Tate implemented a lead nurturing program that supplements sales activities by communicating with prospects via branded emails. Foxford Communities, Bob Ward Companies and Plote Homes are the most recent additions to Stevens & Tate’s portfolio of real estate marketing clients. The firm has been the agency of record for the Chicago division of K. Hovnanian® Homes® for a decade, and has worked with national builders such as Ryland Homes, Centex Homes and D.R. Horton as well as local and regional companies such as Tim O’Brien Homes, Krughoff Homebuilders, Kirk Homes, and Dubin Residential. To learn more about real estate marketing, click here. In addition to creating focused, targeted solutions for clients in the real estate industry, Stevens & Tate has experience in the senior living, active adult, hospitality and travel/tourism, food/grocery, retail, healthcare, business-to-business, and non-profit sectors, as well. Stevens & Tate is a full-service Chicago advertising and marketing agency offering award-winning, on-strategy creative; integrated message development; Internet and digital advertising; social media solutions; and cost-effective media planning and execution. To learn more about Stevens & Tate, visit the company’s website at www.stevens-tate.com or call (630) 627-5200.